Security confirming my identity before telling me I’m banned for life from Venetian properties! 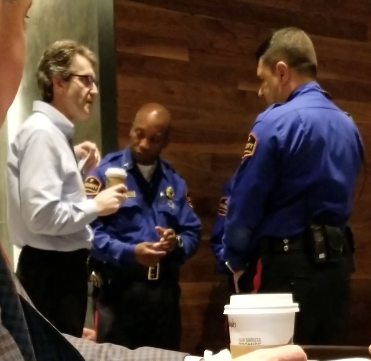 A lot of people have been asking – why did security pull me out of a Starbucks in the Venetian on the last day of the #HRTechConf Expo? What was my crime? It could be a number of things, but we don’t really know. The only communication received so far was “here are 7 officers who are telling me that I was deemed a competitor by the show organizers and then, as they walked me to the curb they read me a printed blurb about how I will be arrested for trespassing if ever I return to any of the Venetian properties any time in the future.” Pinball show in 2020 – forget about it. Dinner with friends at Tao’s or Chica’s in 2035 – not without being arrested for trespassing! Supporting all the HR conferences (some more than others, such as the ones that embrace vendor collaboration) and although I supported theirs for 20 years by attending and sponsoring 18 of the past 21 years – I tried several times to buy a pass, but was blocked from doing so. Maybe it was the free networking app https://hrtech.app.link/VegasCZ we offered to the 10,000+ people in Vegas attending one (or more) of the 6 publicly advertised (there were many more private) events who were wishing for an easier way to connect & collaborate with each other while in Vegas. Perhaps they are afraid we’re ‘union organizers’ and the vendors will band together and demand better support for vendor collaboration and stand up for their rights to get a better ROI at HR events? Maybe their prepaid security service included 1 free bounce per event and my name was the name the dart hit on their very long list of people banned from their events? Most everyone we talk to are not seeing how we compete with their offerings, and if anything, we complement and enhance the ROI of their event. Many vendor execs have told us they would not have made the trip to attend just their event, but our VIP event and/or free networking app helped them pre-book meetings that helped justify the expense to make the trip to Vegas, and to also attend the #HRTechConf. Unfortunately, this move is the latest in a long history of examples of how the people at LRP Publications (the company that runs the conference) have been bullies and everything I’ve seen and heard indicates their culture is anything but collaborative. I cannot imagine how people can work for them – check out their Glassdoor reviews, it’s frightening how they treat their employees. If you discount the few current employee obviously fake 5.0 reviews, their current 2.5 rating would drop to a deplorable level. For me it’s a very sad time for the industry that I have loved for 26 years, but hopefully it’s a tipping point… A heartfelt thank you goes out to all of you who have written your thoughts in support. To all of you who want to say something, but are stymied by fear of retribution from the organization that runs what used to be the industry’s favorite watering hole, to now being more of a cesspool, thank you for listening. As you reflect on the types of event organizations you want to support, have solace in knowing there are lots of great options – check out our calendar based list on the events tab of HRTechAlliances.com. Feel free to reach out privately should you want our opinions on which shows truly create an environment that facilitates vendor-to-vendor collaboration to help drive deals via alliances & partnerships. The shows that make these extra efforts will bring additional ROI to their exhibitors, sponsors and vendor executives, and therefore will bring rewards to the organizers and the entire industry – especially the end customer… when the vendors collaborate effectively, the joint customer is the big winner; and when the customer wins, everyone wins. Our mission at HR Tech Alliances – helping vendors create and manage their alliances & partnerships, to better serve and retain their mutual customers, and to win more deals by collaborating with their partners. Join the conversation about this on Facebook, Twitter or LinkedIn.